Colin Craig ready to jump into bed with John Key…who’s ‘too gay’ now? 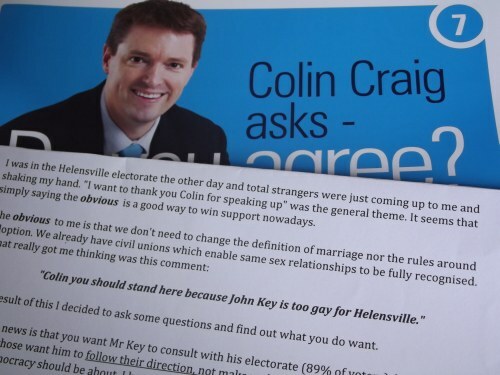 12 months ago the Conservative party sent a newsletter out to residents of John Key’s Helensville electorate citing a local’s opinion that John Key was ‘too gay for Helensville’. The political posturing around the Conservatives and National at the moment is interesting but it seems that while Mr. Craig may endorse the view that Mr. Key to too gay for Helensville, it’s now obvious that Craig is just gay enough to jump in bed with the Prime Minister. We all know how MMP works and if the Nats ‘get into bed’ with the Conservatives it’s the start of a new era of ‘any partner for power’. John Key has described himself as ‘fiscally conservative and socially liberal’ in an interview I did with him a few years ago and went on to say that if you keep the purse strings tight you can then spend in areas of social need. Whilst I think his record is not quite as ‘generous’ as that you have to say that in the areas that National has been socially liberal like the ‘anti-smacking’ law and marriage equality there is deep division with the Conservatives. Whilst this would not normally be a problem between parties who focus is things like the economy and ‘jobs for New Zealanders’ this is not the case with the Conservatives. Turning over the anti-smacking law is Colin Craig’s number one objective in politics. Opposing marriage equality is also right up there so whilst there is a lot of generous spirit at the moment and acknowledging that ‘we need to work together’ you have to remember that for the Conservatives it comes back to a couple of big social policies, that they disagree with National on, and those policies are what the Conservatives are built on…they are their core beliefs. I was at Conservatives HQ in the last few months and suggested to Colin Craig’s press secretary that he’d have much more a chance at the next election is he moved publicly away from these kinds of conversations, there was a wide eyed look of shock to that suggestion and I was told in no uncertain terms ‘but that’s Colin’s passion‘.’Okay, but who is here to counter Colin’s passion for political balance or even just another perspective, for example who is on the board who supported Sue Bradford’s law reform?‘ The answer was ‘No one‘. I have no issues with people who oppose either of those social policies, that’s your right as a citizen and voter, however when they are ‘your passion’ and you are being touted as the person who will hold up the next politically right Government it is likely a concern to some. Colin Craig is a wealthy businessman which I congratulate him on, his success in the world of business is admirable, the success has given him access to vast sums of money. He has spent millions of his own money on his campaigns and protest marches to this point. The only reason there is a Conservative Party is Craig’s own personal $1.6 million donation at the last election…then there is the ‘March for Democracy’ ($400,000) and his Mayoralty campaign. If it wasn’t for Colin Craig’s personal wealth, there would be no Conservative Party, no TV interviews, no chance of winning a seat. I wonder how many will be uncomfortable with the idea that should he be elected, Craig’s wealth has been the main reason he is now in politics as without the wealth, no one would have had the chance to vote for him. If we are potentially in a new era of ‘any political partner so long as we stay in power’ I wonder what the voter will do? Will the voter support that view and just to keep their party in charge they will open the door to anybody else to make up the numbers, or will the vote decide that it’s safer not to allow these one policy ponies in with unknown consequences. Morning, Pat – I’ve been reading your blogs on different topics and it’s been interesting to me that there seem to be very few replies from readers, commenting on the issues you raise. I’ve been surprised and have pondered on the reasons for that. It’s occurred to me today that the theme of most of your blogs appears to be “having a go” at various people and I acknowledge your right to do that. However, it’s becoming a bit boring to read constant criticism and perhaps other people have the same view as me and hence the lack of comments. You might argue that it’s because they agree with what you write but I would have thought, if they did, they would register that with a “good on yer, Pat” or similar comment! I can’t recall any blog where you have congratulated somebody on what they’ve done or said but would be very happy to have that view changed if you have something in your archives! This morning’s blog on the Conservative Party seems to be “sour grapes” on your part and I am wondering about your motive? Your views often come across (to me, at least) as very jaundiced and maybe that’s because you’re a seasoned commentator and cynicism and “sour grapes” becomes part of who you are ? Colin Craig is probably sincere in his ‘social’ beliefs but that only marks him more threatening. Combine this with his personal wealth and what is missing is a rabble rousing charismatic speaker and a Machiavellian political strategist. The fact that other leaders of religious denominations might not be attracted would not detract from his appeal. The more traditional conservative National supporters might find this a problem. Not because of the ideas but because of the associated working class bias and expectations. Optimistically one policy ponies historically don ‘t usually get the numbers in any election in New Zealand. Housing, jobs, education, health, honouring The a Treaty are the issues. Witch hunting, Jew baiting, scapegoating gays, promoting child discipline generally don’t get a big nod in our little country? I am a supporter of the NZCP and I’m appalled at the use of this quote. If Colin Craig echoes these sentiments – re John Key, then I’ll have to reassess my level of support. It’s not just the use of the quote, it’s also possible that the quote vwas delivered malicously in the hope that it would be used. Either way using that stupid sentiment in promotional material is a big blunder.